Two placed Arcs (the one on the right is a Full Circle Arc). An arc is a primitive design object. It is essentially a circular track segment that can be placed on any layer. Arcs can have a variety of uses in PCB layout. For example, they can be used when defining component outlines on the overlay layers, or on a mechanical layer to indicate the board outline, edges of cut outs, and so on. They can also be used to produce curved paths while interactively routing. Arcs can be open, or closed to create a circle (often referred to as a full circle arc). Click Home | Place | and select the required placement mode from the menu. Click Home | Place | to immediately place an arc as a full circle. Click Home | Place | to place an arc in Edge mode. Click Home | Place | and select a different placement mode from the menu. Place arc by center – this method enables you to place an arc object using the arc center as the starting point. Place arc by edge – this method enables you to place an arc object using the edge of the arc as the starting point. The arc angle is fixed at 90°. Place arc by edge (any angle) – this method enables you to place an arc object using the edge of the arc as the starting point. The angle of the arc can be any value. Place full circle arc – this method enables you to place a 360° (full circle) arc. Click or press Enter to anchor the center point of the arc. Move the cursor to adjust the radius of the arc, then click or press Enter to set it. Move the cursor to adjust the start point for the arc, then click or press Enter to anchor it. Move the cursor to change the position of the arc's end point, then click or press Enter to anchor it and complete placement of the arc. Continue placing further arcs, or right-click or press Esc to exit placement mode. Click or press Enter to anchor the start point for the arc. 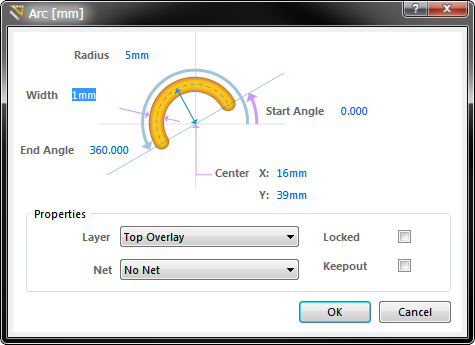 Move the cursor to adjust the radius of the arc, then click or press Enter to anchor the center point. Move the cursor to adjust the radius of the arc, then click or press Enter to set it and complete placement of the arc. For all methods (excluding full circle arcs), press the Spacebar before defining the arc's end point, to render the arc in the opposite direction. Press the L key to flip the arc to the other side of the board – note that this is only possible prior to anchoring the arc's start/center point. Press the Tab key to access an associated properties dialog, from where properties for the arc can be changed on-the-fly. Note that the attributes can be modified during placement, press Tab to bring up the Arc dialog. Changes made will affect the object being placed, and subsequent objects placed during the same editing session. An arc can be placed as a layer-specific keepout object or an all-layer keepout to act, for example, as a placement or routing barrier. Objects defined as keepouts are ignored during output generation, such as photo plotting and printing. A layer-specific keepout arc is simply an arc object with its Keepout property enabled, an all-layer keepout is an arc that has been placed on the Keepout layer. To place a layer-specific keepout either place a standard arc on the required signal layer and then enable the Keepout checkbox to make it a layer-specific keepout, or use the predefined Arc keepout placement command, available in the sub-menu on the Ribbon at Home | Place | Keepout. To place an all-layer keepout make the Keepout layer the active layer, then place an arc from the Ribbon (Home | Place | Arc). This method of editing allows you to select a placed arc object directly in the workspace and change its size, shape or location, graphically. Selected Arcs (Full Circle Arc on right). Click and drag A to adjust the radius. Click and drag B to adjust the end points (start and end angles). Press the Spacebar to rotate the arc anti-clockwise or Shift+Spacebar for clockwise rotation. Rotation is in accordance with the value for the Rotation Step, defined on the PCB Editor – General page of the Preferences dialog. Press the X or Y keys to mirror the arc along the X-axis or Y-axis respectively. This method of editing uses the Arc dialog to modify the properties of an arc object. Double-click on the placed arc object. To toggle the units of measurement used in the open dialog between metric (mm) and imperial (mil), press the Ctrl+Q shortcut. This affects the dialog only and does not change the measurement unit currently selected for the board (Home | Grids and Units | Metric or Imperial).